The day when we all feel a little bit guilty giving our moms just another store-bought card because how in the world could a little drugstore greeting card possibly convey the gratitude that we feel for everything they’ve done for us?! So since generic greeting cards are just alright (yeah, I said it — you can do better), and because I know you procrastinated and won’t have time to get to the store before it closes anyway, it’s time to break out the big DIY guns and make your mom a card that will secure your spot as favorite child for at least another year. 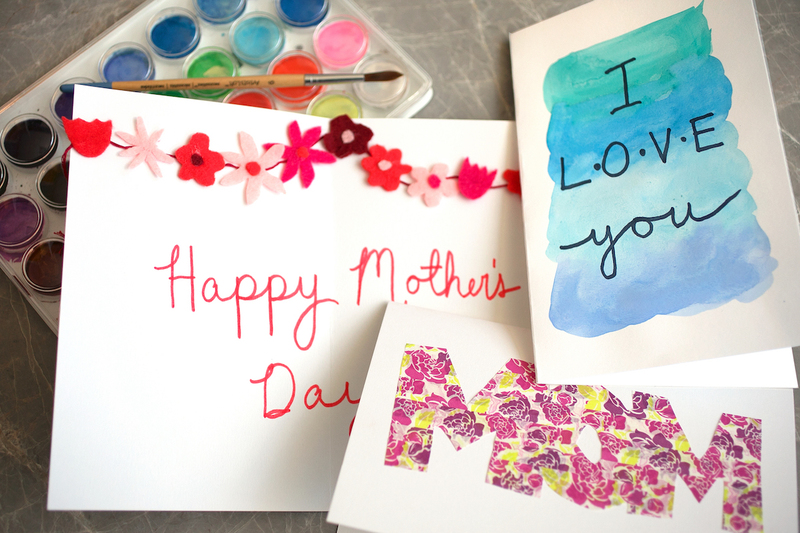 And to help you make sure that your DIY Mother’s Day card doesn’t end up looking like the version you gave her when you were 5, I rounded up five ideas for creating beautiful, inexpensive DIY Mother’s Day cards that are sure to make her cry (because goals, I guess). All you need to make this card look like you slaved over it for hours is some thread or thin yarn and a crafting needle. I was inspired by this post, but I decided to try coming up with my own design for an “embroidered” Mother’s Day card. You can use any phrase or doodle to make the design your own, though! You can find a link to a pattern and tutorial for the original version here. For this one, you’ll need a piece of cardstock, a couple of brightly colored sheets of paper or felt, a hot glue gun and a piece of string. Start by folding your cardstock in half, making sure to press the crease firmly. Open the card and lay it flat, then measure and cut your string so it reaches from the top corner on the left side to the top corner on the right side with some slack in the middle for that banner “swooping” effect. Next, cut basic flower shapes from the brightly colored paper or felt, then glue them along the string, leaving half an inch of exposed string on either end. And there you have it — an adorable flower banner for Mother’s Day! This one is the perfect pick for all you last-minuters out there because it takes five minutes, tops. I was inspired by this awesome card, which packs a lot of punch for such a simple design: all you need to execute this one is a blank piece of cardstock and a steady hand. What you say is up to you, but using a bit of bold humor makes the card stand out on its own — no crafting required. For how vibrant and fun this one turns out, it’s almost shockingly easy to do. I followed this tutorial but used regular cardstock instead of watercolor-grade paper, and it turned out just as nice. All you have to do is write a note to your mom on the inside and you’re good to go! This one might be my favorite of the bunch — it turned out even better than I thought it would. I loosely followed this tutorial to create the washi tape “MOM” (although I changed up the font to make it easier to cut out). Then, I stuck it onto a folded piece of cardstock and bam! Instant favorite-child points. So there you have it: five adorable, easy and inexpensive ideas for wowing your mom on Mother’s Day (without looking like a rogue toddler armed with a box of crayons and a tube of glitter glue). And while that beautiful, handmade (but certainly not preschool-esque) card will make your mom a little misty-eyed, the real triumph here will be rubbing your favorite-child points in your siblings’ faces for an entire year. Either way, your mom is going to love whatever you give her because her baby made it just for her. Your Turn: How will you be celebrating Mother’s Day this year? Grace Schweizer is a junior writer at The Penny Hoarder. Does mentioning your mother in an article on the internet count as a Mother’s Day card? If so, hi Patty.